I wish I could have taken a picture. Last Friday, as I was driving to work, I saw a young family out for their morning exercise. Their child was in a stroller, pushed by the mother on in-line skates, while the dad was jogging alongside. All going together, as a unit, in the same direction, but using different methods. This incident reminded me of the sermon the previous Sunday, when the pastor spoke about spiritual gifts. The Holy Spirit gives us spiritual abilities as He decides. Too often we are not satisfied or content with His choice. This analogy makes our petty jealousies seem silly (as they are). For years I envied those gifted with singing talent. I make a joyful noise to the Lord. Only after many years did I finally start to understand God’s wisdom. With a good voice, I would tend to sing for my own glory and pleasure, not His. How many times have I read of famous stars that misused their ability and yielded to the temptations of fame and fortune, to their eventual ruin. Now I can enjoy good singing and beautiful music and give the glory to God for the talent He has given to the performers. All our gifts and abilities ultimately come from God. Are you good looking? That depends on genetics, not anything you really did. Are you smart? Artistic? Same thing. God designed our first parents to have an enormous range of genetic potential and variety. We don’t choose our parents, and we don’t choose our inherited talents. So why be puffed up with pride for something out of our control. I love the variety within the Body of Christ. All the gifts are necessary for the church to function in a healthy manner, to go in the same direction, and to fulfill the mission that Jesus gave us to accomplish here on earth. The Apostle Paul tells us why the Holy Spirit equips us: “Now to each one the manifestation of the Spirit is given for the common good.” (1 Cor. 12:7). Notice the reason. Not for ourselves but for others. And we are accountable to God for how we use(or misuse) our gifts. 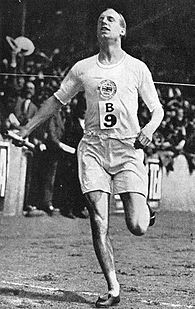 Eric Liddell. Photo courtesy of Wikipedia. Not only would it be boring if we were all the same, but we glorify God all the more by serving together in harmony. As a wonderful by-product, we receive great pleasure when we use His gifts for His purposes and not our own. The Olympic runner and later missionary to China, Eric Liddell, memorialized by the movie “Chariots of Fire,” said, “God made me fast. And when I run, I feel His pleasure.” What an awesome privilege! Read 1 Corinthians 12 – the whole chapter. What natural talents and abilities do you have? If you are a follower of Jesus, do you know your spiritual gifts? How do you use these gifts? For your own glory or for God’s?